I’ve only been back from OnStage in Atlanta for a couple of days so I’m still overcoming my usual travel exhaustion but I’m excited to share the Varied Vases Stamp Set with you! The Varied Vases Stamp Set was created by Mary Fish as her Million Dollar earner set. I think it’s so cool that once you reach a Million in Sales you get to create a stamp set. I’m working towards that Million! OK… Since I’m still struggling with fatigue and feeling exhausted, I’m going to try to keep my blog post short. So, welcome to the April One Stamp At A Time Blog Hop! This month’s theme is “Pocket Full of Posies.” Once you are done here, don’t forget to check out the other blogs! 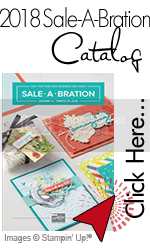 I’m so excited about the 2018-2019 Stampin’ Up! Annual Catalog. There is SO much wonderful prettiness. As I expected, Stampin’ Up! is introducing new colors besides the In Colors. There are 13 colors leaving but plenty of beautiful colors to replace them with a focus on balancing out the color spectrum. Oh, how I DO love color! I have a really cute box and 4 Narrow Note cards featuring the Varied Vases Stamp Set. The cards are clean, simple and fun. I then created a box for the notecards! Keeping with the spring theme, the box features Lemon-Lime Twist! I can see that the Varied Vases Stamp Set will quickly become a favorite especially when I want to create clean, simple, and elegant cards! Besides the awesome stamp set, I love that there is also a coordinating punch! Varied Vases is sure to be a hit and a stamp set you’ll want to add to your repertoire as soon as possible! Each card features all of the NEW 2018-2020 In Colors except for Blueberry Bushel. I’m absolutely in love with Grapefruit Grove and Pineapple Punch. These cards are easily re-creatable. This is a quick box that I put together. To create the box, I measured the envelopes and added 2″ to the measurements for the base and I added 2 1/8″ to the measurements for the box cover so it easily slips over the base. Lemon-Lime Twist seemed to be the perfect color for this cute box. On the lid of the box, I add a Whisper White Layer that is stamped using the Varied Vases Stamp Set. The flowers are stamped with Memento Tuxedo Black then each little flower is stamped with Grapefruit Grove. To get the variations in color, I stamped as usual but some stamps I stamped off color then stamped. For the darkest flowers, I actually stamped them repeatedly. To finish off the box, I created a cute little tag. I used the Tag Punch, stamped the images with the Varied Vases Stamp Set, punched and assembled. The tie around the box is from the NEW Nature’s Twine Pack. To continue on with the next blog on the OSAT Blog Hop, you’ll want to visit Rick Adkins! I’m certain you’ll enjoy the projects he has to share with you! To view his blog, click on his name in the blog roll below.